This is of course, about love, but it is also about science. Both things highly relevant in a Digital Romance Lab. Last week, I went to an excellent lecture entitled “The Limits of Science” at the Royal Institute, delivered by famous scientist Professor Peter Atkins. He concluded that indeed, science has no limits; that everything in the universe is within the realms of scientific interrogation. This includes ourselves; our human experience. While there were clearly those in the audience who balked at the very secular nature of Professor Atkin’s talk (and made it painfully apparent during the Q&A), I am always keen to underscore, as Atkins himself did, that this doesn’t, in any way, reduce the magnificence of existence. Science is, quite literally, awesome. A wonderful, secular kind of awe, which both humbles us and inspires us. That we understand so much of it, and yet so little, is also amazing; we humans are truly marvellous beings. And so, we too are open to examination by science. Our human experience is open to examination. Indeed, Atkins stated that “consciousness is open to elucidation by simulation.” Of course, Atkins was talking about building artificial, machine-based models of the brain, in order to explore the notion of consciousness as its emergent property. I’d like to extrapolate from this however, to explore how else simulation can help us to understand consciousness, though perhaps not in the way that Atkins meant. After all, simulations are, essentially, an embodied model of our understanding of something. Our simulations of the brain are models of our scientific understanding of it. In this way, simulations are also expressions of the way we see the world; or, at least, of how we want to represent it. During the Q&A, Atkins conceded to one art-advocating audience member the idea of examining Pride and Prejudice, for instance, in order to learn something of Jane Austen. This is very true. If we consider Pride and Prejudice to be a kind of simulation of Austen’s understanding of gentry society in 19th century England, this teaches us a great deal about how she saw the world; indeed, of how she saw romance. Simulations are not objective, and videogames especially are interesting in this respect. As noted by Harvey Smith, “it’s through the interactive systems–as related to the player’s agency–that we see the artistry in video games”. Indeed, this is how games create meaning through the gap between its rule-based procedures, and the player’s subjective response. This is what Ian Bogost calls the simulation gap. Therefore, in playing video games, we are able to critically reflect; to learn something about not just the game’s creator, but about ourselves. Videogames are, then, excellent tools by which we can explore what it means to be human; to help us to explore, and unravel our subjective selves. In this way, games can help us to explore a crucial part of the human experience: Love. The questions of how we do this are what we are exploring here at Digital Romance Lab, and I am absolutely thrilled to join this exploration. I began this inaugural post promising to speak more of love, so having defined the important ways in which simulation can help us to elucidate the human experience, I will go on to to that. But, with a warning that it is a love which is also heavily intertwined with science, again. But it is also beautifully romantic. Romance. I wanted to share one of my favourite stories on the subject. It relates (as most of my favourite things do, to those that know me) to the late Carl Sagan. More specifically, to Carl Sagan, and Annie Druyan, and to billions and billions. This story comes from RadioLab, both on the episodes titled ‘Space’ and ‘This is Your Brain on Love’. “We felt, first of all, that this was a kind of sacred trust; that here we were, half a dozen very flawed human beings, with huge holes in our knowledge of all of these subjects, building a cultural Noah’s Ark. It was a chance to tell something of what life on Earth was like, to beings of perhaps a thousand, million years from now. Because the Voyager engineers were saying this record will have a shelf-life of a billion years. “On June 1 1977, I had been looking for some time for that piece of Chinese music that we could put on the Voyager record and not feel like idiots for having done so. I was very excited because I’d finally found an ethnomusicologist, a composer at Columbia University, who told me without a moment’s hesitation that this piece ‘Blowing Streams’, which was represented to me as one of the oldest pieces of Chinese music, 2500 years old, was the piece we should put on the record. So I called Carl, who was traveling. He was in Tuscon, Arizona, giving a talk. And we had been alone many times during the making of the record, and, as friends, for three years. And neither of us had ever said anything to the other; we were both involved with other people, we’d had these wonderful, soaring conversations, but, we had both been completely professional about everything, and as friends. And my heart completely skipped a beat. I can still remember it so perfectly, and I said “For keeps?” and he said, “You mean, get married?” and I said “Yes!”. We had never kissed, we’d never even had any kind of personal discussion before. We both hung up the phone, and I just screamed out loud, I remember it so well, because there was this great Eureka moment. It was just like, scientific discovery. What a wonderful, beautifully romantic story. (I’ve always enjoyed the dedication to Ann Druyan in Cosmos: “In the vastness of space and the immensity of time, it is my joy to share a planet and an epoch with Annie.”) But, the story of their getting together gets even better still! It also relates back, more explicitly, to science, and to Professor Atkins’ musings on consciousness as emergent from our material brains. Two days after she and Carl declared their love for one another, Annie had a thought. She wondered if it might be possible to compress the impulses in one’s brain and nervous system into sound, and put that sound on the record, in hopes that the extraterrestrials of the future might be able to reconstitute that data into thought. She asked Carl what he thought of this, who told her “A thousand million years is a long time. Why don’t you go do it, because who knows? Who knows what is possible in a thousand million years.” So, then, Annie recorded her brain waves, and every little impulse given off by her body, at the Bellevue Hospital in NYC. I can never get over how beautiful this is: the thought of Anne Druyan’s meditations on being in love with Carl Sagan, speeding into the infinite depths of space. 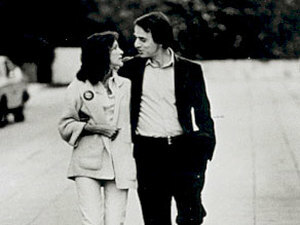 Annie Druyan and Carl Sagan’s love will exist, literally on record, long after our species has ceased to exist. What an absolutely incredible, beautiful part of the human experience for future extraterrestrials to find, a billion years from now. In the same way that those theoretical future beings may find Annie Druyan’s impulses, and translate them into thought, how can we, at Digital Romance Lab, provide players with the appropriate procedures, the appropriate simulation, so that they too, may translate from it, an understanding of this beautiful human experience – of what it feels like to love. This is what we hope to explore. >Another Carl Sagan fan here. His series Cosmos is utterly timeless, though it was good to get an update on most of the theories via last years Into the Universe from Stephen Hawking. Recommended watching if you haven't seen it. >Great post, very excited to read more. I think that finding a way to connect people through video games in this way is a fantastic idea, I can only imagine how amazing the experience would be. >Phenomenal post! I found it looking for a transcript of Annie's discussion on Radio Lab. I was thinking of writing a very similar post on my blog: http://navfin.blogspot.com/Don't need to, you wrote it! Like you I was extremely touched with the notion that maybe…just maybe Annie's love for Carl may be transcribed in some fashion on that record and that someone eons from now may figure out how to decode Annie's meditation and be struck with awe. We have our failings, but human love to me is the magnificent hallmark of our species. Thank you for an very interesting post.